Half a century ago, West Ham and Magdeburg were level in Europe in the Cup Winners’ Cup. A short review of the match day programme. It is now 50 years ago that England have won the World Cup featuring a number of players from London’s East End: Bobby Moore, Martin Peters and a certain Geoff Hurst. Those three were also playing in Europe just two months before the tournament commenced. Moreover, West Ham were holders of the trophy having won the Cup Winners Cup in 1965 against 1860 Munich at Wembley. 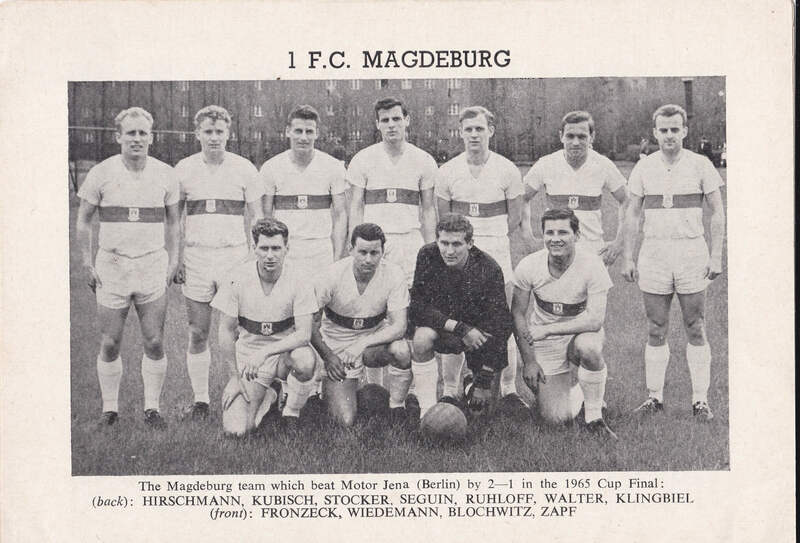 In March 1966 West Ham had to face Magdeburg in their first encounter with an East German team: FC Magdeburg. Back then, the position of both teams could not have been more different. West Ham, the holders had their climax behind them while Magdeburg was only playing their second time in Europe and their moment of glory was to come in 1974. Yet, the foundation was laid in the mid-1960s, most notably with the arrival of Heinz Krügel, the most successful coach in Magdeburg’s history for the 1966/67 season. While West Ham have good chances to play European football next season, Magdeburg will continue to remember fondly the days when they were regular starters in European competition. Nothing much has changed 50 years later. The real talking point was the match day programme for the first leg at Upton Park. On page 3 the visitors found a welcome note by West Ham in German! According to this, Magdeburg had an excellent reputation from previous tournaments giving hope for an interesting tie. This was a very polite gesture. Magdeburg only played their eighth European Cup game at West Ham, therefore the reputation was limited at best. While this is indeed a nice gesture of the hosts, the tone is somewhat too polite and the text too polished to be heartfelt. Rather, this was an attempt to relations when there were none or hardly any. Britain has not acknowledged East Germany officially until 1973 which turned the GDR into terra icognita during early decades of the Cold War. The statement in the note that West Ham have heard excellent reports about the city of Magdeburg beggars belief even today. What would a football club, what could they have known about East Germany? The Other Germany? The country was almost unknown to the majority of Britain, not to mention club officials from West Ham! Therefore, this phrase is nothing but exaggerated politeness. No match day programme comes without fault. And so we find here that West Ham are looking forward to the Matsch (sic!). Matsch means mud and although many football pitches often looked and still look like mud, this has nothing to do on a European night. The match at the Boleyn Ground was the sort of victory West Ham needed to keep their European Cup run going. It was an intensely fought match in which Magdeburg came close to cause an upset said Harry Miller in the Daily Mirror. Though they benefited ‘from a mountain of mistakes’, the East Germans were nonetheless ‘quick to cover in defense and clever at creating space’ for themselves. Alas, their shooting let them down this evening. West Ham scored the only goal of the evening just one minute into the second half when Peters crossed for Hurst whose header fell to Byrne who finished from 5 yards. The writer of that little note wished the visitors from Magdeburg to take many positive experiences back home to the GDR. Indeed, they did: eight years later it was Magdeburg who won the trophy against AC Milan. After this short introduction written in German, the text then switches to English and provides a brief history of football in Magdeburg; it must have been the first longer account of East German football history in Britain! The tie was over with West Ham the luckier team. Only a few weeks later a core of their squad would play a prominent part in England’s triumph at the World Cup. Magdeburg meanwhile suffered the misfortune of being relegated. It led the club officials to hire Heinz Krügel. It was the best that has ever happened to the club.